Striking views and tasty beef await at this modern steakhouse at the Hilton Anatole. 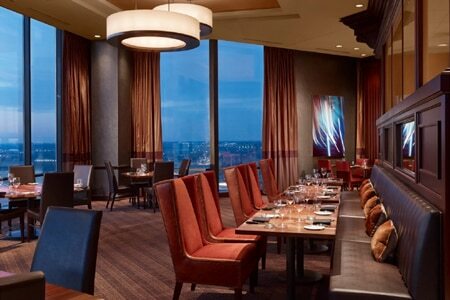 : The city views certainly draw many people to this modern steakhouse perched on the 27th floor of the Hilton Anatole, but once the food arrives you may find yourself forgetting all about the sparkling skyline beyond the windows. As would be expected from a steakhouse in this price range, the slabs of red meat are quite good, particularly the 16-ounce bone-in filet. Enjoy it unadorned or dress it up with various crusts (smoked bleu cheese, pimento cheese, white bbq sauce) or enhancements (bourbon sorghum onions, green chorizo gravy, foie gras). While the steaks are excellent, don’t skip the appetizers, particularly the jumbo lump crab cakes with country ham, green tomato relish, malted aioli and buckwheat salad. Other options for seafood fans include shrimp and grits, trout and striped bass. Sides of mashed potatoes with bone marrow butter and rich mac 'n' cheese made with andouille crumble and truffles are a must. Cap off the meal with “crème brûlée” panna cotta with pistachio ice cream. SER Steak + Spirits often hosts wine or spirits dinners, and special emphasis is put on the seasonal cocktail program.